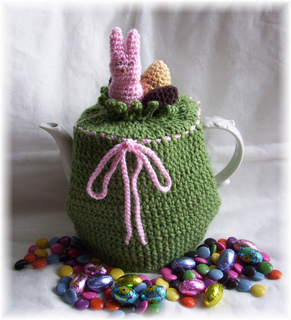 Who doesn’t like a hot cuppa tea to go with their Easter chocolate. This cute ‘bunny sitting in the grass’ easter cozy will keep the tea hot while you peel all the foil off your chocolate eggs. Thick and warm, this cozy measures approx. 7” x 10”. PDF pattern will be emailed within 24 hours of receiving payment, usually much sooner.